The Internet has drastically changed the way organisations now conduct their business, customers expect companies to have not only a Web presence, but also to allow them to experience many of your business services online. Failing to offer the customer this level of customer service can prove costly, as they are but three clicks away from many of your competitors. With over 15 years experience in Software Development, we know we can help your business reach its full potential. We work carefully with the client to ensure that their needs are met, this often involves several steps including requirements gathering and wireframe demonstrations, just so that we can get a proper understanding of what our clients expect. After this we build all our Web solutions to World Wide Web Consortium (W3C) standards to ensure the highest level of usability. With the growing shift towards mobile devices we now ensure our applications are also being built with a mobile first approach. Our service does not stop once a Web solution has been delivered and signed off with a client, we pride ourselves in our post customer care which means we are only too willing to support all the products we have designed for our clients. 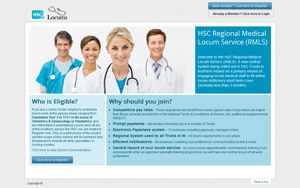 The HSC eLocums site allows locum doctors to complete an online application form stating which grades and hospitals they are available to work in. Following approval of applications, the system identifies locums who can work in a particular hospital and at a specified grade and speciality. Shift invitations are sent to the locums via SMS and email. 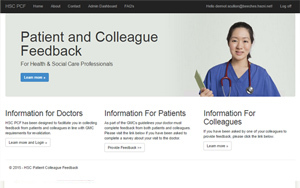 This system has been built in line with the Trusts' Appraisal policy. 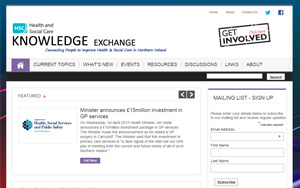 The Knowledge Exchange is a resource for people delivering Health and Social Care in Northern Ireland. The site provides space for staff with a responsibility for delivering Health and Social Care in Northern Ireland to meet, discuss, debate and tackle emerging and current trends in health and social care. It provides access to resources, good practice, leading thinking and up to date news and events across local, national and international systems. 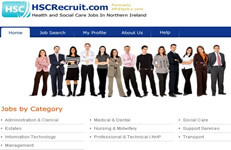 HSCRecruit.com is a custom built web based solution which allows HSC organisations in Northern Ireland the opportunity to carry out their recruitment process online. By using HSCRecruit.com organisations can advertise their upcoming jobs online, receive applications electronically and extract with ease valuable data that integrates seamlessly with their other backend systems. Our team has also developed software for the management of Equipment, Online Bookings, Staff Activity, Time Recording, reporting and evaluation. Solutions such as these have made huge strides towards achieving the paperless office. A paperless office is a work environment in which the use of paper is eliminated or greatly reduced. This is done by converting documents and other papers into digital form. Proponents claim that "going paperless" can save money, boost productivity, save space, make documentation and information sharing easier, keep personal information more secure, and help the environment. If you feel there is an area within your organisation that would be improved by the implementation of a custom built software solution then please get in touch with our software development team.